FREE Custom T-shirt! Your sellers get a FREE Custom T-shirt with your group's logo and slogan for every 10 Discount Cards you buy. To be eligible for the FREE T-shirts you must call us at 1-888-440-4114 to place your order. Have us build a high-value local discount card, customized with your group name and with local discount offers. Why Will Your Supporters Love the Local Discount Card?! - They simply show the card and save! 1. We'll send you a list of 300 merchants in your area - choose your favorite 75. 2. We'll contact these merchants and assemble a card with 10 valuable discounts. Priced to Sell: Your supporters get access to 10 incredible discounts at local retailers for only $10! Your Profit: It varies between 50% - 70% profit depending on the quantity of Local Discount Cards ordered. The more you sell, the more you make! 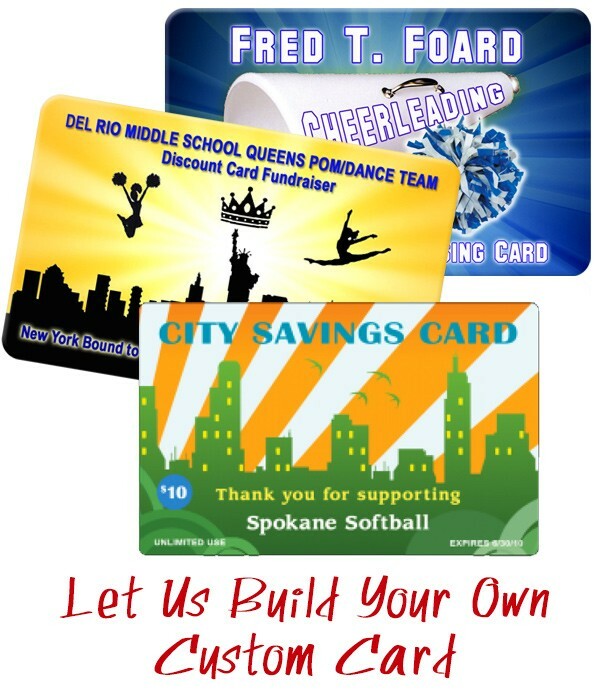 Free Personalization: These local discount cards come personalized with your group name and logo. Delivery Time: Because we have to solicit local merchants on your behalf, delivery may take up to 5 weeks from the date we initiate the order. Free Shipping and Low Minimums: Your group receives free shipping on all orders, and the minimum order is only 250 cards. A group of 25 participants should be able to easily sell 10 Local Discount Cards each. Payment Methods: Credit card, money order, purchase order form for public schools, 30-day financing available - call us! How Does The Local Discount Card Work? 2. Order approximately 10 Local Discount Cards per participant, depending on how motivated you feel they are. 4. We’ll send you a list of 300 merchants in your area – choose your favorite 75. 5. We’ll contact these merchants and assemble a card with 10 valuable discounts. 6. We will customize the cards with your group name and logo. 7. Shipping: It will take up to 5 weeks to receive your order. 8. Prepare and send a letter to your group members and their parents so they are aware of the objective of your fundraiser, collection dates, and your contact info. 9. Keep track of how many Local Discount Cards you have distributed to each of your fundraising participants. Ideally, have the parents pick them up so they become more involved in the fundraiser. 10. Your participants will sell each of these cards for $10 each, and collect their money on the spot. 11. Keep a tally of all the money you collect from each of your participants throughout your fundraiser. 12. When the fundraiser is complete, be sure to send a Thank You note to all parents and kids who participated. 13. Count the profit made from your fundraiser! We are raising money for our Spring sports programs - Arena football, LAX and Cheer!